John Lunn suggested that Charles Tyldesley, great-grandson of Thomas Tyldesley 1657-1715, the Diarist, disappeared "silently into the darkness" after the sale of Holcroft hall on 27 July 1770. However, as seen in an earlier posting Charles Tyldesley may have simply crossed the border into Cheshire to live at Ollerton—a mere 15 miles from Holcroft Hall. 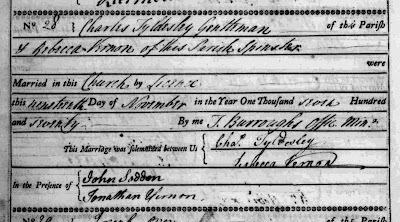 And indeed on 19 November 1770, Charles Tyldesley is found marrying Rebecca Vernon at the Parish Church of St John the Baptist in Knutsford. Interestingly the marriage was by Licence rather than Banns. This may be an indication that Charles Tyldesley adhered still to the Catholic faith, and it is certainly a sign that he was a man of some status. 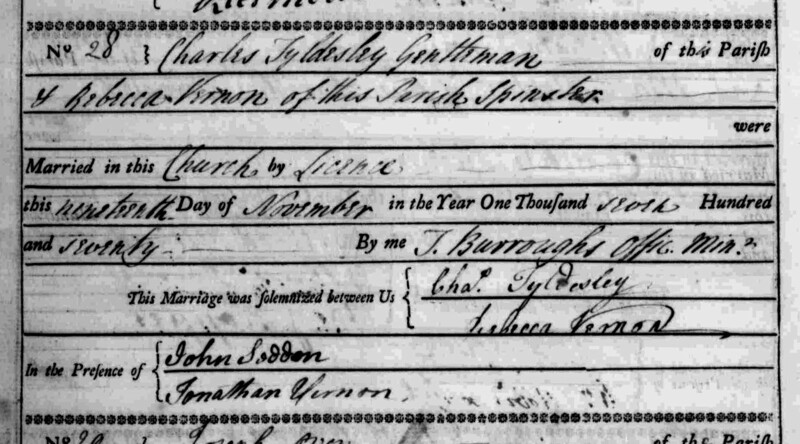 From his marriage bond and allegation dated 2 November 1770 and transcribed below it can be seen that Charles Tyldesley's bondsman was James Sale of Leigh, giving a link back to an area of Lancashire very familiar to the Tyldesleys. Even better, there is the signature of Charles Tyldesley which may enable conclusive identification of this Charles Tyldesley as the great-grandson of the Diarist. KNOW all Men by these Presents, That we Charles Tyldesley of the parish of Knutsford Gentn & James Sale of ye parish of Leigh shopkeeper & of the Diocese of Chester are holden and firmly bound unto the Right Reverend Father in God Edmund by Divine Permission [FN1], Lord Bishop of Chester in the sum of one hundred Pounds, of good and lawful Money of Great-Britain, to be paid unto the said Right Reverend Father, his lawful Attorney, Executors, Administrators or Assignes, To which payment well and truly to be made, we bind ourselves and each of us severally for and in the whole, our Heirs, Executors, and Administrators, and the Heirs, Executors, and Administrators of each of us firmly by these Presents. Sealed with our Seals and dated the 2nd Day of November in the tenth Year of the Reign of our Sovereign Lord George III King of Great-Britain, France, and Ireland, Defender of the Faith, and in the Year of Our Lord God, One Thousand Seven Hundred and seventy. not knowing or believing any lawful Let, or Impediment, by reason of any Praecontract, entered into before the Twenty-fifth Day of March, One Thousand Seven Hundred and Fifty-Four, Cosanguinity, Affinity, or any other Cause whatsoever, to hinder the said intended Marriage: And he prayed a Licence to solemnise the said Marriage in the parish church of Knutsford aforesaid. In which said Parish the said Charles Tyldesley further made Oath That the said Rebecca Vernon hath had her usual Abode for the space of Four Weeks last past. From later evidence there is little doubt that Charles and Rebeccca Tyldesley were to have at least three children.